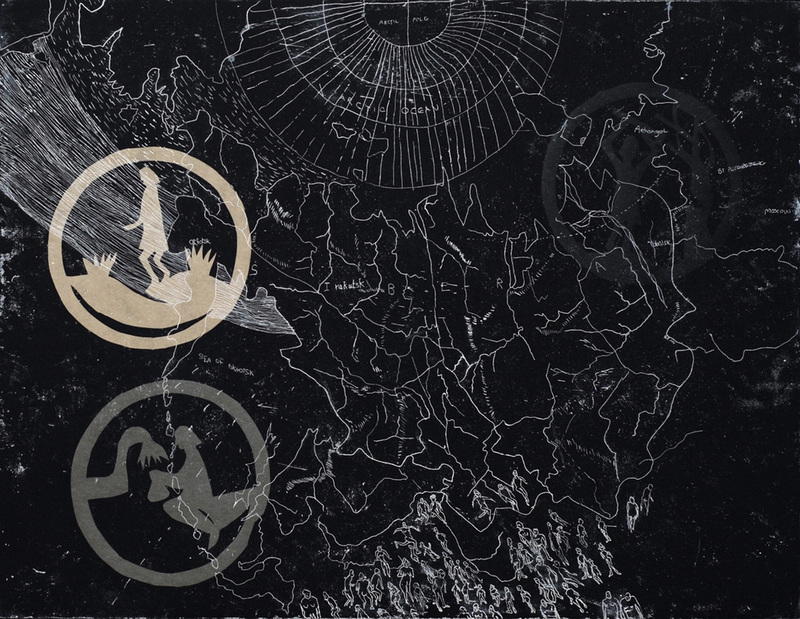 Siberia - Irrational representation III is part of a series of etchings exploring, landscape, cartography, symbolism and identity. I have been interested in the juxtaposition of how cartography changes to reflect shifting landmass and also human and animal movement across landscapes. Within my own family's history, my grandparents, Polish Jews, were taken to a hard labour camp in Siberia, where my grandmother at the age of 12 was sent to cut down trees, as her mother was too ill to do so. They eventually escaped by walking at night and hiding in the day time, surviving often on one potato a day. The family ended up in a displaced persons camp in Germany at the end of the war and now live in Philadelphia and New York mostly. This history - or herstory - forms a backbone to my work, addressing landscape and the stories and shifts imprinted into the fabric of the earth over time.